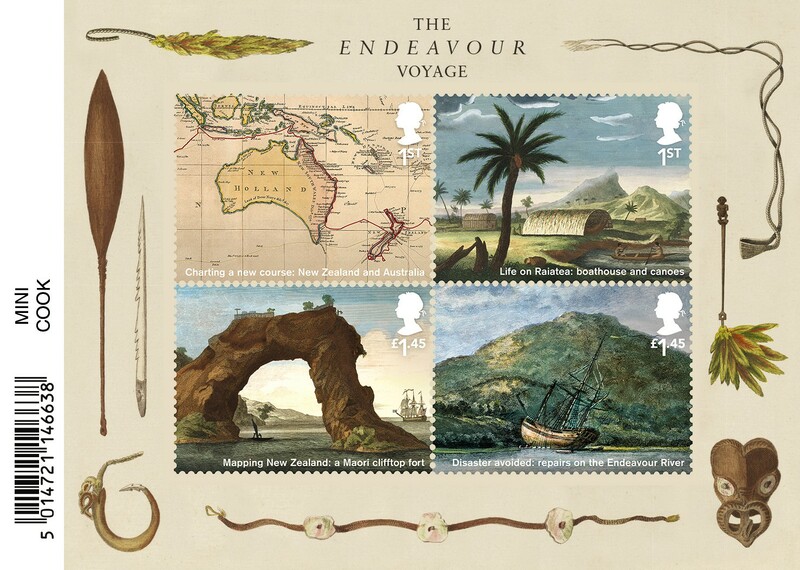 This year marks the 250th anniversary of Captain Cook setting sail in one of the greatest voyages of discovery of all time aboard HMS Endeavour with nearly 100 men including astronomers, artists and scientists. The expedition was an incredible success, during which Cook and his men initiated the first European contact with Eastern Australia, mapped New Zealand and accurately observed the transit of Venus. 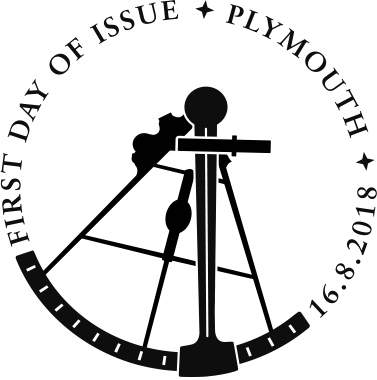 The three year voyage revealed unprecedented information about the lands, peoples, flora and fauna of the Pacific to European eyes, and set new standards for cartography, scientific enquiry and exploration. On 16 August 2018 Royal Mail will issue a set of six stamps in se-tenant pairs, a miniature sheet, and the usual presentation pack, first day covers, stamp cards and a coin cover. Click on the images to see enlarged versions. 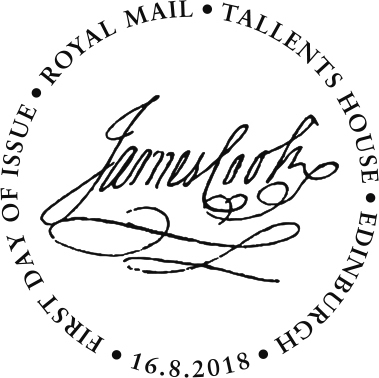 Now available to pre-order on Royal Mail's new shop webpages. by Sydney Parkinson and Passiflora aurantia (red passion flower); and Chief Mourner of Tahiti and a scene with a canoe by the artist of the Chief Mourner. £1.45: a portrait of a Maori Chief with full facial moko, engraving after Sydney Parkinson and Clianthus puniceus (scarlet clianthus) by Sydney Parkinson; and Volatinia jacarina (blue-black grassquit) by Sydney Parkinson, Sydney Parkinson selfportrait. £1.45 An arched rock with a Maori clifftop fort in New Zealand; and Repairing The Endeavour on the Endeavour River, Australia. 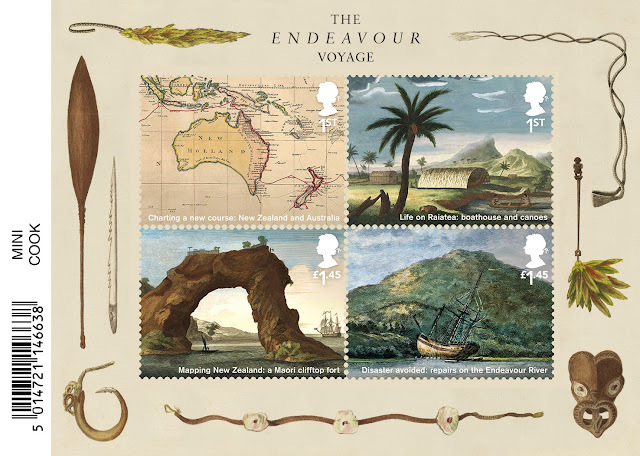 Background: Hand-coloured engravings from A Journal of a Voyage to the South Seas, 1794. Technical: stamps and miniature sheet are printed in litho by ISP on ordinary gummed paper. The stamps are 37 x 35 mm, and the sheet 115 x 89 mm, with stamps 41 x 30 mm.